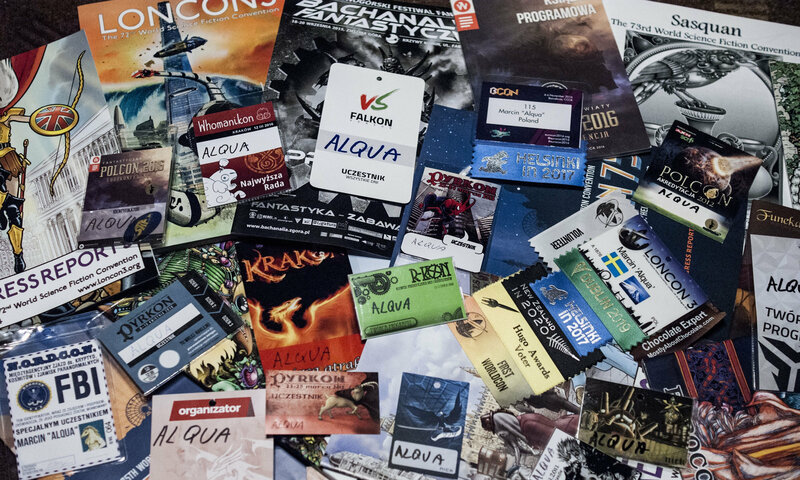 Over the last few years Śląski Klub Fantastyki (Silesian SFF club) haven’t organized a typical SF con. There was Asucon – a M&A convention. There was also Seminarium Literackie (Literary Seminar), which is a small, almost purely literary convention. Still, no typical con was held until this March. Śląskie Dni Fantastyki (Silesian SFF Days) were held in a manner that reminded me of old Polish cons. Everything was taking place in a school. There were just a few programme streams and in general “the feeling” was somehow typical of the old Polish cons. As you might have noticed, this is the type of conventions that I like. Yet there were a few things that were different than my memory serves when I think about the cons from my early years. There were two filk/folk concerts. They were supposed to be given by two different artists but as one was not able to come, Harfiarka agreed to play both on Saturday and on Sunday. Harfiarka on her first concert on Saturday afternoon. 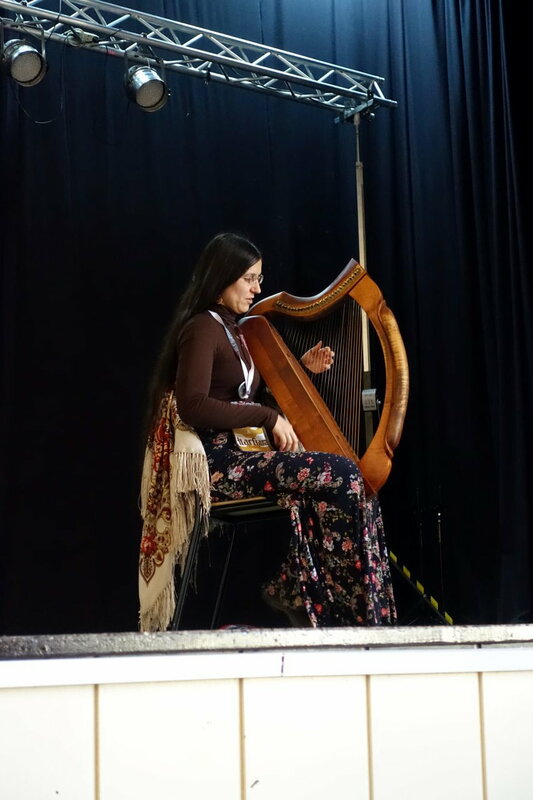 Harfiarka (Barbara Karlik) plays a Celtic harp and I really like both the sound of the instrument and her voice when she sings. Even though the concerts were held on two consecutive days, they were not the same. Some songs were repeated, but not all of them. Thanks to that, I enjoyed them more on the second day, as I knew what to expect. If you don’t know her works, you can visit her site and listen to a few songs. I was surprised by the library being available at the con. It occupied one classroom, where you could browse through some of the books from ŚKF’s library. I didn’t use it as I was busy doing other stuff, but I know there were people who enjoyed their reading time. Having a library like that is not typical for Polish cons. It was done years before, on manga conventions, where people could borrow mangas and printed copies of fanfiction, but I haven’t seen it done for years. Convention chair in front of the library shelves. The other surprising event was a ball. Truth be told, I did expect it, as it was announced before the convention, but even this announcement itself was surprising. 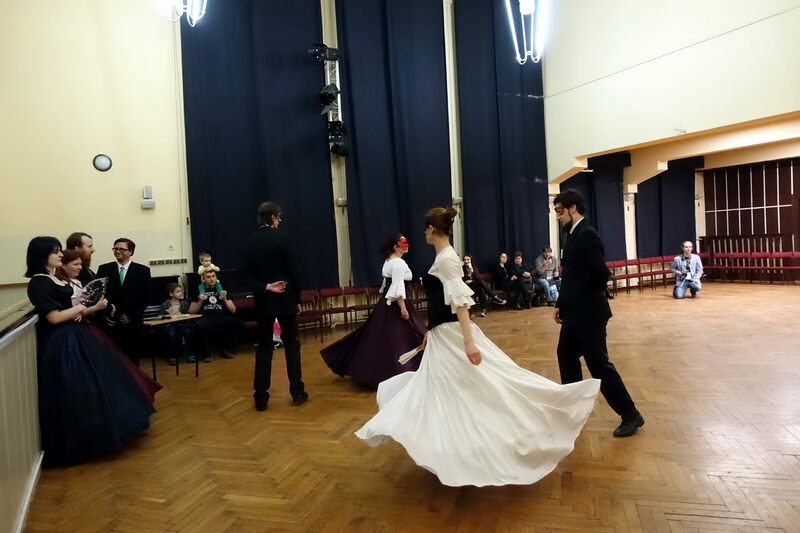 I thought it will be a simple dancing event, but when I arrived (and I was able to attend only the beginning), I realised that it started with a demonstration of dances, followed by a dancing workshop. I was not there long enough to know whether it ended with something I was really expecting or not. Although the convention lasted only for two days and there were only a few programme streams, the list of topics was quite broad. There were items relating to superheroes and popculture, items on historical topics as well as ones about science. 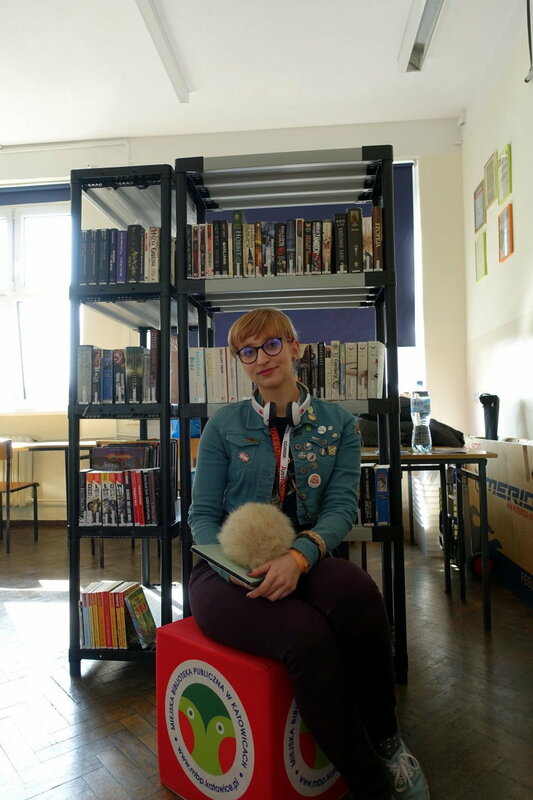 Of course, booklovers were also able to find a lot for themselves – starting with meetings with authors, through panel discussions, up to the public reading of Tolkien’s works. The latter event was organized because the convention was held over weekend on which the Tolkien Reading Day fell. 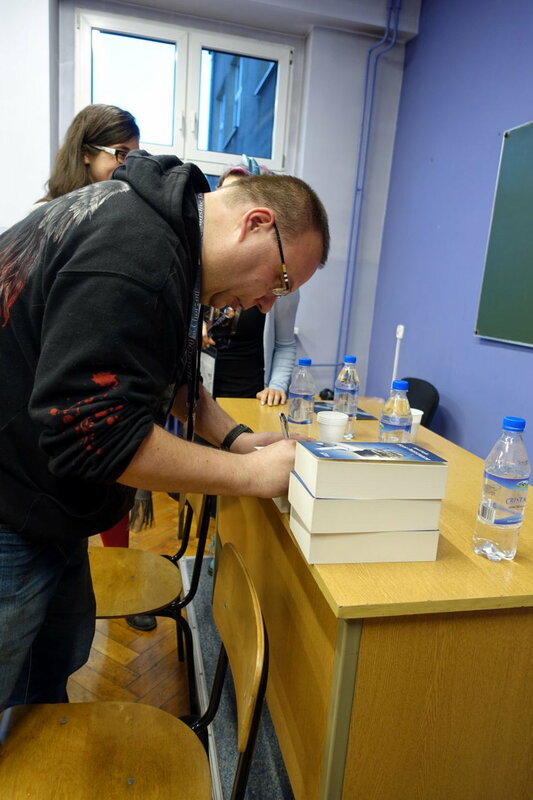 Paweł Majka signing few copies of his book for a book discussion club. I am really happy that the con organisers decided to have two programme items related to international fandom. 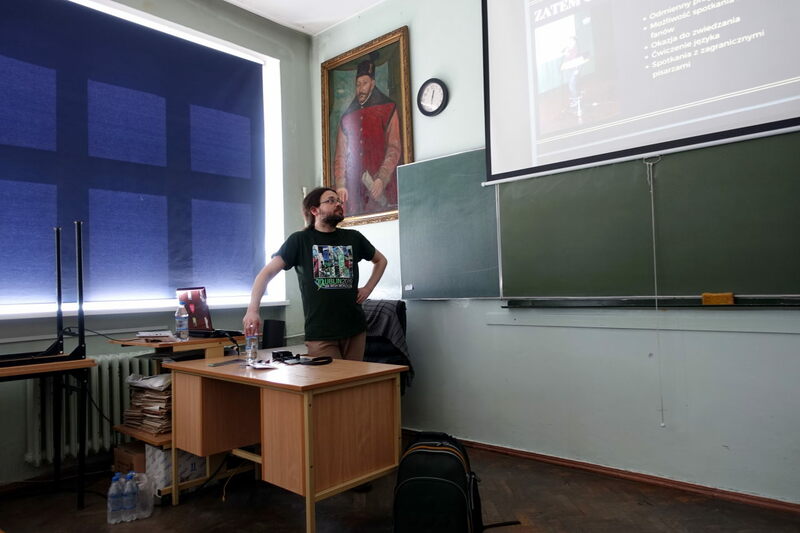 I gave a talk entitled From Chorzów to New York, where I elaborated a little bit on my congoing philosophy (in fact, mainly why I attend cons outside of Poland). The second item was a panel discussion How do they do this in the world – a word on conventions abroad. I am not sure how many people will start travelling thanks to such items, but each and every person will bring me joy. I am giving presentation about my congoing “philosophy”. My next post will be about Follycon (2018 Eastercon) and will be published on 30th April. Next PostNext Is it a folly? No, it’s Follycon!